Even with the rise of e-commerce and the use of mailer envelopes, corrugated boxes remain most everyone’s shipping container of choice. It’s easy to understand why, since they’re widely available, reliable and provide the greatest amount of shipping space. But those same advantages also make nearly every corrugated box look the same, and in our world of online shopping, that means your shipments can get lost in that sea of kraft. Enter custom packing tape. It’s vibrant, eye-catching and shines a spotlight on your brand. 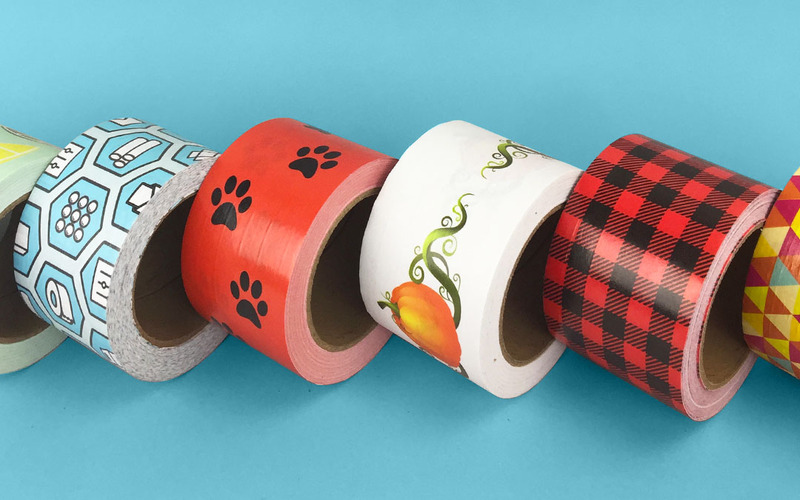 Here’s 3 reasons why your business (whether physical or online) should be using custom packing tape to seal its customer purchases. Custom packing tape pulls double duty, making it one of the hardest working packaging supplies out there. First, it’s carton sealing tape, ensuring that your boxes are properly closed and able to survive the delivery trip to their final destination. Second, it’s a canvas for your branding. Your logo is one of the most important cornerstones of all your marketing and advertising efforts. Printing it in full colour and repeating it across a strip of packing tape is a truly show-stopping, attention-grabbing tactic. Placed against the backdrop of a kraft corrugated box, it’s branding that both literally and figuratively sticks. There are typically 3 things that keep businesses from adopting custom packaging. Pricing, order minimums and the sheer number of packaging options out there (packing tape, tissue paper, printed boxes, labels and more). Thankfully, digital printing has changed things for the better. As it doesn’t require the use of expensive and multiple printing plates, digital printing reduces the cost of creating custom packaging. That same reduction in production time and efforts means that custom packaging no longer needs to be ordered in prohibitively high quantities. Here at The Packaging Company, you can order just 1 roll of custom packing tape. You can test the waters of custom packaging, or complete just 1 project, without using up your packaging budget or warehouse space. Printing your logo on vibrant, eye-catching packing tape also allows you to brand your customer shipments without investing in the entire world of custom packaging options. Have you noticed how Amazon often brands their shipments with just custom packing tape? They’re the biggest e-commerce company on the planet, and all it takes is one strip of tape to tell everyone who they are. Don’t forget, other printing options still exist—such as flexographic and lithographic printing—but digital printing brings the world of short-run custom packaging into the hands of small businesses. Every business that ships boxes needs to use carton sealing tape. But just as using kraft corrugated boxes makes everyone’s shipments look similar, using standard packing tape has the same result. Sure, most tape shows when someone’s tampered with it, but if thieves are clever and have the same style of tape in their possession, you might not know if they messed with a customer’s order. Custom packing tape helps to combat that issue, simply through the act of being exclusive and unique. Only your business has possession of your custom printed tape, meaning that no one else can tamper with your packaging and then replace the tape unnoticed. Both you and customers will notice sooner if someone’s tried to mess with your shipments, and would-be thieves will likely be less willing to get their hands dirty. Good-looking, branded and protective? Custom tape sounds like a win-win-win to us. Ready to enter the world of custom packaging and custom packing tape? The Packaging Company is your partner in this exciting endeavour, and we can’t wait to help you transform your packaging strategy. Whether you need guidance on custom packing tape, custom tissue paper or any other facet of custom packaging materials, don’t hesitate to contact us. We’re your e-commerce partner, after all.